Each grant covers free registration for the conference and workshops. 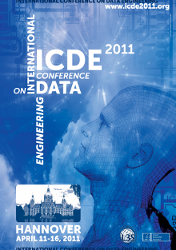 Summarize your research and why it would benefit from you attending ICDE, in one paragraph. Explain with one or two sentences why you require the grant to be able attending the conference. The grant does not require that you have a paper or poster at ICDE or one of the workshops. To apply, please send your name, university affiliation, full post-mail address, and all applicable information in plain text via email to Wolf Siberski at icde-grants AT L3S DOT DE and CC your advisor(s).